Since the time we found fire and walked mostly upright there’s an arc that you can trace in each of the great and not so great civilizations. It starts with some rough approximation of ‘things were hard.’ Potatoes stopped growing; the Pharaoh enslaved us so we escaped to march around the desert for 40 years; the king kicked us out and then taxed the hell out of us without giving us a say; we grew up on the mean steppes of Mongolia with nothing but horses, round and wood-framed tents that will later house hippies, and a desire to raze cities down to their last opulent brick. The hunger driven ambition runs rampant for a generation or so and then the ‘kids these days’ get soft and used to comfort of silk slippers and everything falls apart. In 1200 Genghis Kahn rode forth with the horde and decreed the known world his own. His grandson? Kubla got high on his own supply and in Xanadu did Kubla Kahn a stately pleasure dome decree. A millennia later the Mongolian empire has shrunk back to subsistence eagle-hunting and fantastic throat singing heavy metal. Team Solveig’s story starts with the sister-brother version of an emerging world power. They were a team; she played the role of the achieving older sibling, he tried to catch up, and the sum total is impressive: surfing freighter wakes in the Laser, state level cross-country running in high school, national level Nordic skiing in college. Rock and ice climbing, three-month solo bike trips around New Zealand, backcountry ranger in the North Cascades with untold numbers of alpine routes bested. The pinnacle was the self-supported traverse of southern Chile/Argentina by bicycle, at age 21. Highlights: an out-of-food Thanksgiving with tea and powdered milk for dinner after a day of riding 75lb touring rigs; pushing bikes across the Patagonia pampa in close drafting formation because the wind was so strong they had to swap leads even to push the bikes on foot. Adventure of a lifetime, and the inspiration for the R2AK. 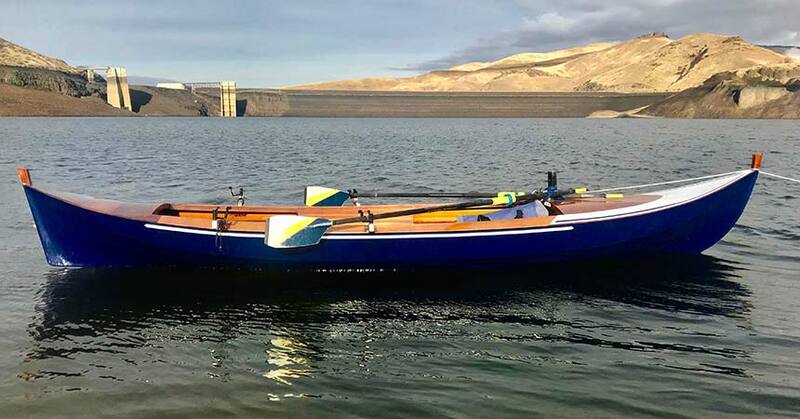 As part of their later life Viking rejuvenation, their bid to reunite with the horned-helmeted times of their twenties involved entering the R2AK with a boat that pays homage to the Viking roots we made up for them. Their faering is the strip-built modern take on Viklandia’s traditional smallyboat. Double ended and as beautiful as it is seaworthy, this particular kit boat was originally built for a cruise down the Mississippi, and since R2AK-upgraded with new carbon spars, sliding seat rowing stations, and dagger board/rudder retrofits to allow it to survive 21st century ‘discoveries’ of submerged and overlooked parts of the New World. Welcome to the R2AK, Team Solveig. Do well enough and maybe Ikea will name an end table after you.